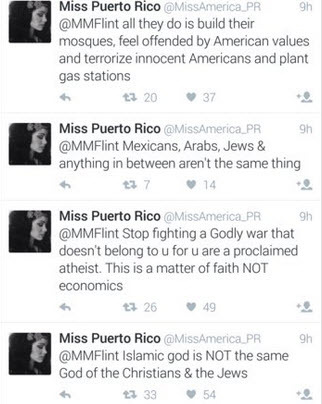 It seems that anti-Muslim bigotry has also creeped into the Miss America pageant with the current Miss Puerto Rico being suspended after posting a series of anti-Muslim bigoted tweets. 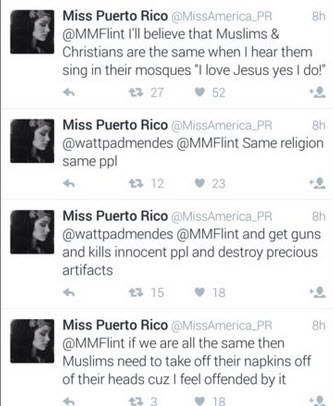 Posted by Destiny Velez, it prompted a printed apology by the Miss Puerto Rico Organisation, a copy of which is listed below. “The Miss Puerto Rico Organization is a non-profit corporation that offers scholarship assistance and career opportunities to young women in Puerto Rico. 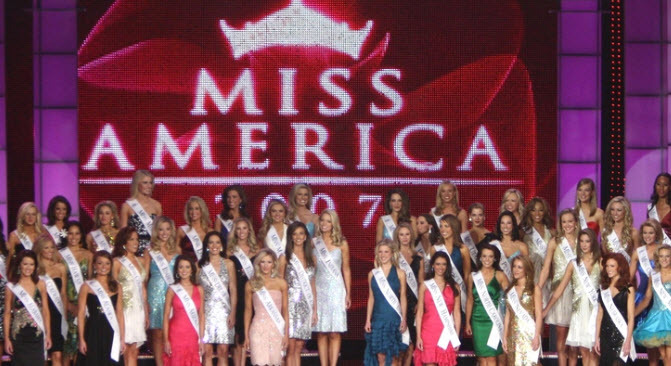 As part of our unique identity, our program recognizes the elements of providing scholarships to young women; the traits of honesty, good character, talent, poise, intellect, leadership, and good judgment among today’s young women; and enables contestants to serve as role models to other young women with similar goals and characteristics. In regards to Miss Puerto Rico, Destiny Vélez’s recent actions and conduct, the Miss Puerto Rico Organization feels that her words do not represent the integrity and esteem of our program, nor that of our board members, our sponsors and partners, or the National Organization.